Jazz in the Park begins year 15 of free jazz concerts on June 8 with a performance by the West Ottawa High School Jazz Band starting at 6:30 p.m. Organizers say the move makes the event open to a larger audience. Jazz in the Park, formerly Jazz at the Zoo, begins at Ah-Nab-Awen Park this summer on June 8. The yearly concert series is presented by the West Michigan Jazz Society. The jazz society has produced free jazz concerts in Grand Rapids for 14 years, becoming a summer tradition. Moving to Ah-Nab-Awen Park for its 15th year is a big change. "We at WMJS are very excited about the new location for our free jazz concerts," Donna Kahny, Vice President of the WMJS says. "We believe this will enable us to make these concerts available to a larger audience. The park is convenient for people who work downtown and those visiting our city to walk to. This open area is very accessible and there is plenty of parking. There will be more food vendors, and more security. We hope the folks who enjoyed the concerts at the zoo will give Ah Nab Awen Park a try!" The event continues to be free thanks to support from the City of Grand Rapids and other sponsoring individuals. 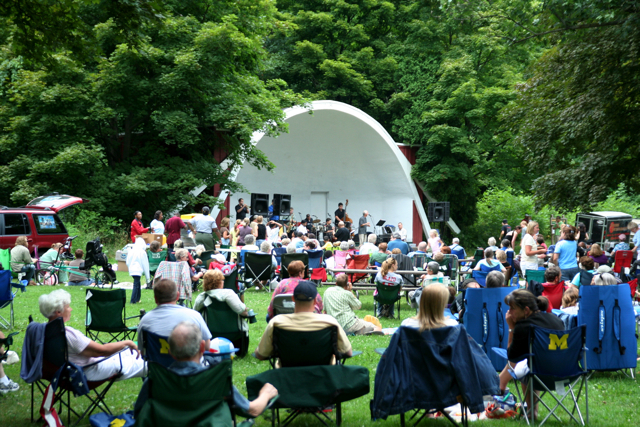 The 2015 Jazz in the Park Concert Series will run from June 8 to August 10, 2015, from 6:30 p.m. to 8:30 p.m.